Arts and crafts style meets urban sophistication with this lamp table. 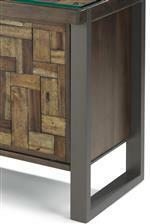 The piece features a steel base topped with a mixed wood top for a rustic industrial look and feel. 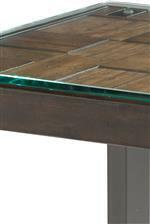 A glass top overlay completes the table, providing a smooth surface and adding an element of refinement to the table. The Patchwork Lamp Table with Glass Overlay Top by Flexsteel at Colder's Furniture and Appliance in the Milwaukee, West Allis, Oak Creek, Delafield, Grafton, and Waukesha, WI area. Product availability may vary. Contact us for the most current availability on this product. Taking its name from its unique table top designs, the Patchwork collection of occasional tables offers striking rustic style for your home. Table tops are a combination of acacia, pine, birch, and mahogany woods laid out in a unique format that evoked the patchwork of a favorite quilt. Smooth glass top overlays provide an easy-to-clean surface and lend an air of sophistication to the rustic designs. 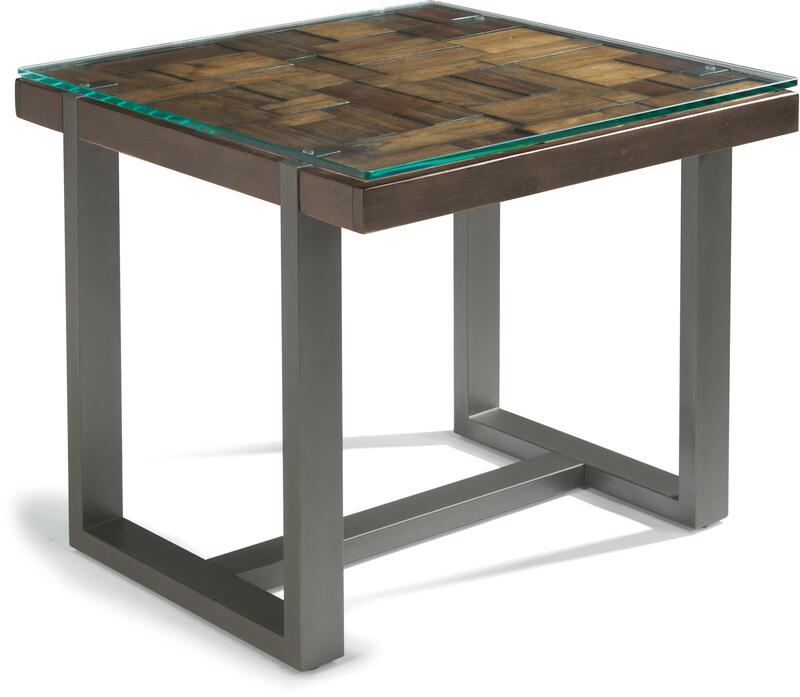 Steel frames bring industrial edge to each table to complete the urban rustic looks. The Patchwork collection is a great option if you are looking for Industrial furniture in the Milwaukee, West Allis, Oak Creek, Delafield, Grafton, and Waukesha, WI area. Browse other items in the Patchwork collection from Colder's Furniture and Appliance in the Milwaukee, West Allis, Oak Creek, Delafield, Grafton, and Waukesha, WI area.